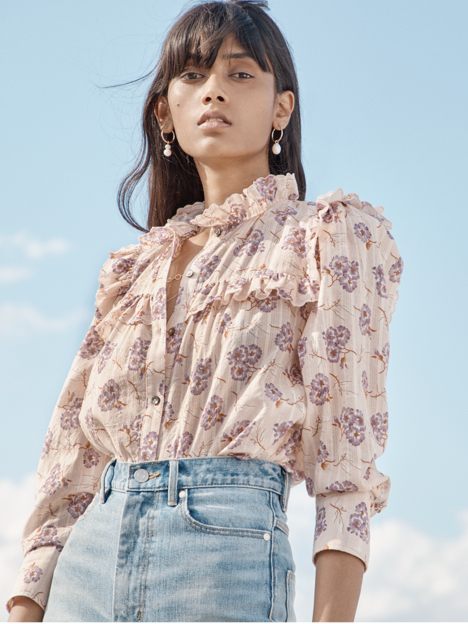 Crafted from crisp cotton poplin and printed with soft emerald florals, this short-sleeve top will instantly brighten your wardrobe. Crafted from crisp cotton poplin and printed with soft emerald florals, this short-sleeve top will instantly brighten your wardrobe. Its gently puffed sleeves meet a ruffled neckline that can be buttoned to a keyhole or left open. Pair it with our Emerald Daisy Wrap Skirt for a head-to-toe floral look.